Some fates seem set in advance. That, like Oedipus, no matter what you try to avert things you end still with the preordained outcome. Lewis Hamilton in the British Grand Prix benefited from just that, claiming his fourth home win in a row. Around Silverstone the Mercedes driver was as usual on another level. In advance we realised only the unusual could deny him, and nothing of that ilk materialised. A poor start? It wasn't brilliant yet he held Kimi Raikkonen's Ferrari off to lead. Rain? No - that stayed away (though as if to show how things smiled upon him, it arrived in a big way shortly after the chequered flag). You can guess the rest. He simply moved clear. After the solitary stops he was more than 10 seconds away from the next guy. He won by 14. It was a Grand Chelem also - pole, fastest lap, win and led every lap. All appropriate. It was in more than one sense quite the home run. And of course he was delighted. "That was amazing, oh my God, greatest day," Lewis beamed. "The team did an exceptional job this weekend," he continued, "the car felt great and the team really were generally faultless." There was no need for Part-Time Motor Trade Insurance. "I was up front, got a good start, after that I was able to manage the gap between myself and Kimi, and just bit by bit extended it. "The support has been immense, I'm glad the rain held off. The amount of flags, the amount of support, the energy was tremendous." And today the mood more generally shifted. From things slipping away from Lewis, suddenly everything thing seems in his favour. Including that most crucial factor known in America as 'The Big Mo'. Thanks to frolics behind, Lewis's title deficit to Sebastian Vettel is now a scant point. That too seemed appropriate to his crushing day. Appropriately too today Lewis equalled Jim Clark's British Grand Prix win record - another who had a magnetic attraction to home victory, almost no matter what else happened. Another who loved to dominate from the front. Lewis matches Alain Prost's British record also - again appropriate, given The Professor tended to win with minimal fuss. Appropriately too the race for the rest was for second. They at least made a race of it, underlining the adage that if you give them a proper race track they'll give you a proper race. 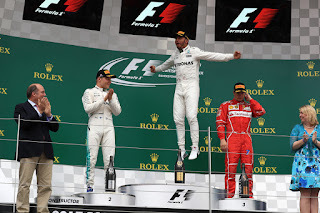 The ever-racy Max Verstappen got past Vettel's Ferrari from the off (aided by Seb's brakes catching fire as all waited for the red light going out) and exhilarated those in the tribunes with his subsequent defence of his third place - as usual with Max dancing on the outer edge of aggressive acceptability. Seb got ahead of the Red Bull in the pitstops, but in terms of places ahead his goose was cooked. It got worse for him later. The other Mercedes of Valtteri Bottas and Daniel Ricciardo in the Red Bull also made fine and thrilling progress from diminished grid slots. Ricciardo from P19 got up to P14 on the opening tour, then gave a few places back immediately by running off at Woodcote. From then on he was immaculate though, making progress akin to that Rob Walker said once of Prost - "so graceful and sure, almost like ballet". He got P5, passing Nico Hulkenberg late when the Renault developed energy deployment problems. Hulk nevertheless was another to impress. "The whole race was a fight," noted Ricciardo later. "I think in the end fifth was the maximum." 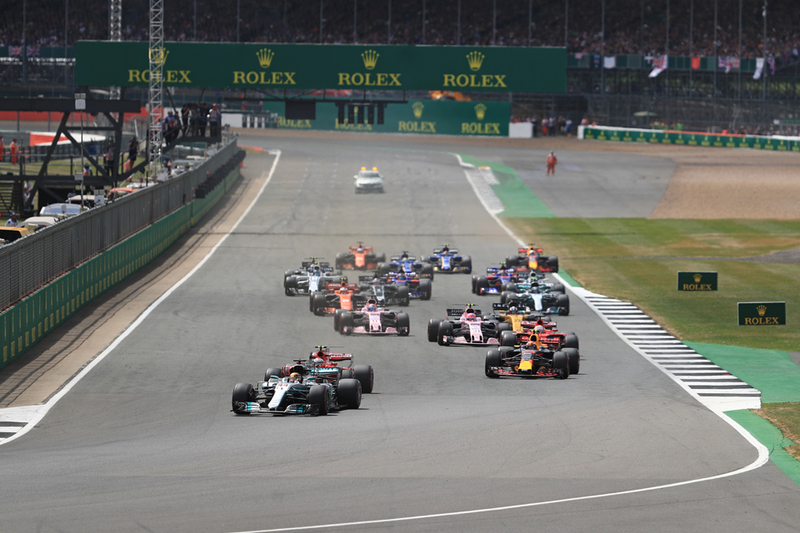 Then we have Bottas, who was quick throughout and quick to make progress, indeed after starting ninth got himself a clear run at Vettel after just three green flag laps. From there he put a contra-strategy to good effect, attacking Vettel in the final stint on softer rubber and depriving him of P3 with eight laps left. "Minimal talking," he said on the way past, summing up his idiom. It looked though that he'd run out of laps to get Kimi in P2, but the race had a scarcely believable coup de grace. With two laps to go Kimi's front-left tyre 'delaminated' as the phraseology goes, sinking him to fourth (and it would have been fifth but Max made a precautionary stop on the same lap after flat-spotting). And before you could reflect on Seb's habitual charmed existence for minimising his point loss to Lewis astonishingly he got exactly the same problem, and much further from the pit entrance. He sank to seventh. 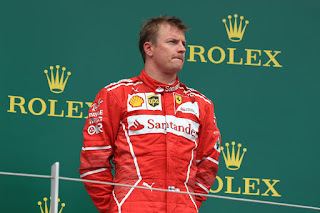 Kimi at least completed the podium behind what was now a Merc one-two. Early reports have it that the two failures were not related. Vettel's was simply getting to the end of the tyre's life. Kimi's tyre instead still was inflated, but the top surface came loose for some reason. Both were surprised too. "Hindsight is great," said Seb, "but at the time it felt okay. So I think it caught us both by surprise." 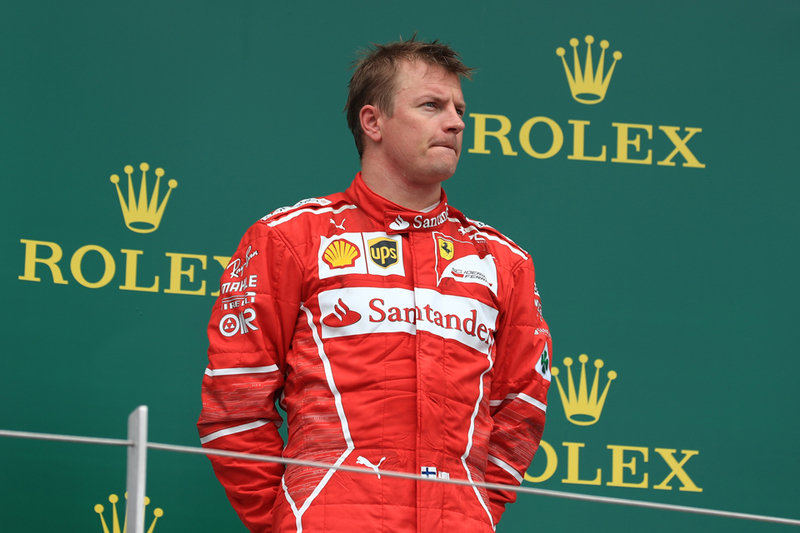 "Everything was going more or less normally," Raikkonen added. "The gap was fine for us. Two laps from the end, I don't know what happened." We've not heard the last of this one. Max went quiet after his early fireworks, and finished a distant fourth. Danny Ric, Hulk and Seb next home we've mentioned. The Force Indias took their habitual double points finish in P8 and P9 - Esteban Ocon was ahead this time thanks in large part to a better start. The pair threatened to have a contretemps as in Canada as Sergio Perez right behind looked quicker for a time. But neither pilot made a thing of it afterwards. Felipe Massa completed the scorers. And for all of the talk of Bottas doing his team mate a favour, including Lewis's compliments implying as much, he did a favour to himself primarily. He too is now within a race win of the drivers' table top - despite his major slab of misfortune this weekend. 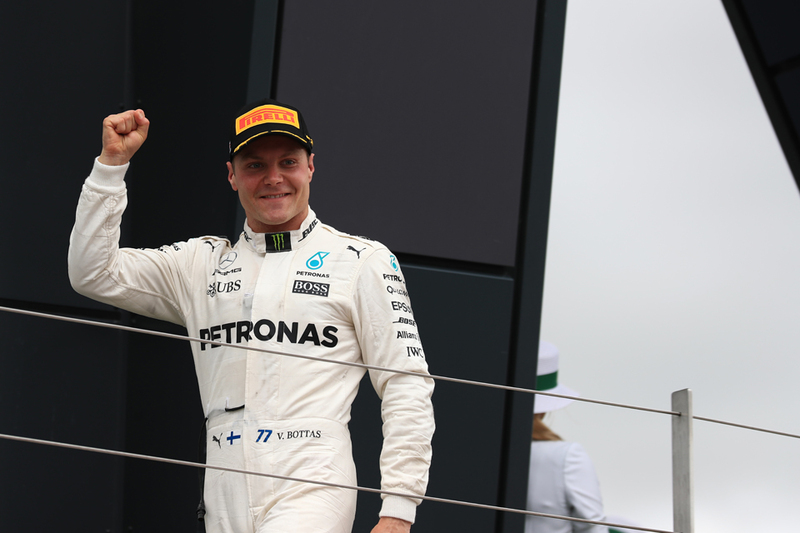 "For us as a team it was really a perfect weekend for the circumstances," Bottas said afterwards. "How we started today from ninth, it's just amazing what we've done today. 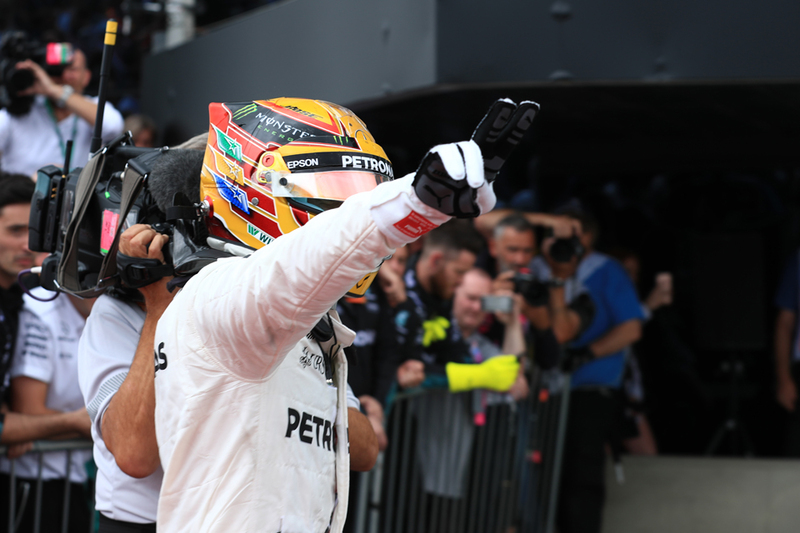 "The car was so good to drive, it was really quick, the team did perfect strategy for both of us, me and Lewis. "I started the race with soft tyres, I had to run really long and we actually extended the first stint quite a bit because everything was still looking good. "Towards the end on supersofts the pace was good with the fresh tyres. I got through on Sebastian, and was closing on Kimi, but I think realistically he was too far away for me to get P2, so I got lucky...but a one-two is perfect." And the fates smiling on Lewis doesn't end here. Next up is Hungary, another track where he always excels. Then it's the summer break. And you now have to go back to Monaco in May for the last round that Ferrari was quicker than Merc. Suddenly things look very different. Suddenly things appear to be going Lewis's way.